All Premium-Line Category 5 UTP multi-pairs installation cable meet or exceed ANSI/TIA/EIA 568A, ISO/IEC 11801, EN 50173 specification. 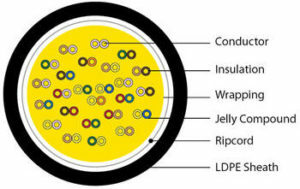 This range of unscreened cables is designed to support Category 3 Link and Channel perfor- mance, with internationally defined Physical and Electrical performance up to 16MHz. All cables comply with RoHS.